Most people know that I'm working as a Research Executive in Yayasan Ilmuwan and one of my job scopes is writing articles. Recently, I wrote an article entitled "Bijak Menggunakan Teknologi Maklumat Seiring dengan Tuntutan Islam" and it was approved by the higher authority in my company and then submitted to Utusan Malaysia. About a week after that i.e. today the article was posted in a column named Wacana Islam with a slightly altered title "Bijak guna ITC seiring tuntutan Islam". Click here for the article. Apart from that, I take this as a first step towards more developments in my career. As I love writing, having the article posted in a prominent yet leading newspaper in Malaysia is something, I have to admit, I'm very proud of. However, that again shouldn't be a big issue as, one it's just my personal achievement, and two there is bigger issue to be discussed: the content of the article itself. Have you read the article? Do you have any additional points? Maybe you want to comment or criticize the article. I'm open for the betterment of my writing skills. You may also question, of all topics, why write about that? Initially, I was planning to write something about H1N1 from which I can relate to my biomedical science background. However, my time was taken after I was assigned for the talk on organ donation last weekend. I had to make proper and full preparation as it was, again, my first experience of delivering speech in front of public after I started my career. Insha Allah, given enough time, I will still write about the H1N1. hi, 1st thing 1st, congrats for ur 1st publication.. it's a good start! actually mayb sbb background aku dari IT jadi aku agak sensitif/tertarik dgn term 'ITC' tu.. tp klu betul tajuk yg ko hantar tu "Bijak Menggunakan Teknologi Maklumat Seiring dengan Tuntutan Islam", maknanya tajuk pada utusan tu editor sendiri yg ubah la eh? 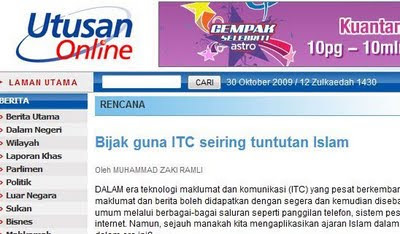 so.. sorry to say, that I believe that the editor was wrong.. 'teknologi maklumat & komunikasi' never be translated as 'ITC' but it is always be 'ICT'.. benda remeh je ni.. xde niat nk jdkan isu, just nk highlight supaya benda kecik mcm ni x menyebabkan ko sbg penulis jadi 'the laughing stock'.. but of course, ia x jejaskan isu yg ko cuba bangkitkan.. mesej tetap sampai..
tumpang gembira dgn pencapaian terbaharu szakif..
u did a good job..
errmm..it seems that, hikmah tak berpeluang sambung hari tu semakin terserlah kan....peluang yg lebih baik dah menanti :D..
salam.. hehe.Maaf bang. tak tau pulak dah ada yg komen ttg penggunaan ITC dan ICT tu. setuju dgn kak ainie..
Masalahnya pada Kau ataupun Dia?